Today a PIL (CPIL vs HUDCO) filed by the Centre for public interest litigation through its counsel, Prashant Bhushan regarding bad loans by HUDCO [writ petition [c] No.573 of 2003] to ineligible borrowers was heard by the Chief Justice of India T S Thakur, and Justices R Banumati and UU Lalit at Court 1 as item No.10. The court, in this case, had in 2005 ordered an inquiry by the Central Vigilance Commissioner (CVC). The CVC had filed a detailed report in 2006. The CVC in its findings held that the loans were given to the borrowers who had already been declared willful defaulters or having very bad track record. Loans were given against all norms and guidelines and therefore, the CVC recommended departmental proceedings and CBI investigation. However, finally all the officers who were indicted by the CVC were exonerated by the government. Today, the petitioners raised the issue of bad debts of public sector banks and how public sector banks are writing off loans in thousands of crores. The court took cognizance of this problem and has impleaded RBI on petitioner’s oral request as a party in the present PIL and directed the RBI to file the list of those borrowers who owe more than Rs. 500 crores and have defaulted and also the list of those borrowers whose loans of Rs. 500 crores and more have been restructured by the RBI by waiving off interest or extending the time limit. 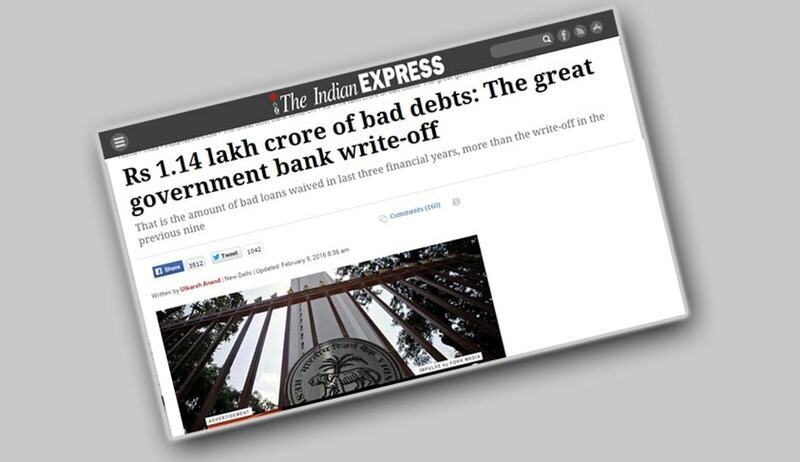 The petition has also annexed the recent report in Indian Express on writing off of Rs.1.14 lakh crore of bad debts by public sector banks between 2013-15. The Indian Express story was based on a reply to RTI application filed by its Supreme Court correspondent, Utkarsh Anand.